Tokaibane Manufacturing is unique among spring manufacturers because its products are made built-to-order and the company makes high-precision, custom-made items according to customer specifications, even engaging in job production, or “jobbing” (i.e. single-item production). Tokaibane can handle a wide range of spring shapes, from coil springs and leaf springs to disc springs and volute springs, and the company keeps a constant stock of 2,500 types of spring materials so it can promptly build products when a client needs them. Tokaibane was founded in 1934. At the time there were already many spring makers in the market, with no room for a new player to enter. That’s why Tokaibane decided not to get into mass production. Instead the company followed a different path by entering a niche market for spring manufacturing, taking on the jobbing, small lot production and special materials that were time-consuming for existing spring makers. As the manufacturing sector grow during the post-war boom years, spring makers were pushed towards mass production and they reaped huge profits as production processes became more automated. Even so, Tokaibane never veered off course, sticking exclusively to build-to-order, jobbing and small lot production while its employees honed their skills. Meanwhile, the company began to gradually systematize order and materials management in the 1970s. When the asset-inflated bubble in Japan burst in the late-1980s, large manufacturers struggled to cut costs as their markets shrank. But Tokaibane kept passing on and improving its workers’ technical expertise and skills. The company remains profitable because it specializes in special, high-performance and high-precision springs that the competition cannot offer. 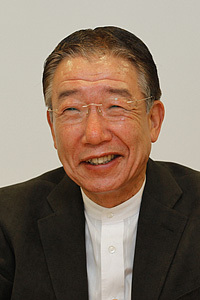 The Hitotsubashi University Graduate School of International Corporate Strategy awarded Tokaibane the Porter Prize in 2008 in recognition of the company’s unique competitive strategy and high profitability. Tokaibane Manufacturing’s Toyooka-Kamiyoshidai Plant in Toyooka, Hyogo Prefecture, a city known for its storks. Spring material stock. Tokaibane keeps a constant, wide-ranging stock of 2,500 types of spring materials so it can handle orders quickly. Tokaibane has more than a few female engineers. 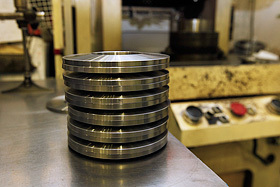 Here, disc spring materials are polished and processed to a thickness of 0.001 mm. Large disc springs are built with a press because cutting them leads to variable stress and does not produce the desired precision. Disc spring heat treatment equipment. While many competing manufacturers outsource heat treatment, Tokaibane provides products with added value by performing heat treatment in-house, despite the cost. Tokaibane finishes up disc spring surfaces by using a surface treatment method called shot peening. The disc on the left side of this photo shows the finished product. 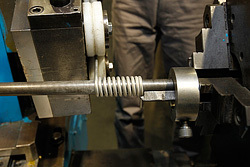 Thin disc springs have their surfaces treated with a method called barrel polishing. Tokaibane makes a sustained effort to inspect springs so that their effects are according to specs. Because it makes products with high added value, the company places a heavy emphasis on inspections, using five types of inspection equipment that apply different forces. A highly skilled engineer makes coil springs by hand at the Keishokan factory. Skilled veteran engineers selected from among the company instruct and pass skills on to younger engineers. A grindstone is used to polish up the end of a coil spring. In addition to coil springs, leaf springs are also made by hand in the Keishokan factory. Disc springs for engine propulsion regulator valves on the H-IIA/B Launch Vehicles. Building springs means developing people. Tokaibane lives on products with added value, not cost cutting. --Tell us what kind of company Tokaibane Manufacturing is. Our company is a purely build-to-order spring maker engaged in "very small" production of many kinds of springs. 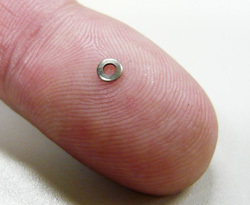 Our production is based on "very small" orders for springs from clients that average five springs per lot. In exchange for small-scale production we have to provide high performance and precision along with special materials. We also do jobbing production of springs - from large to extremely small ones - to meet the strict requirements of our customers. 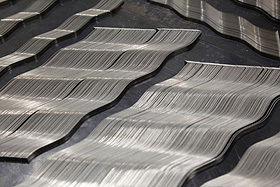 When they hear the word "spring," many people think of the spiral-shaped coil variety, but actually we make any and every sort of spring our clients may need: special volute springs, and of course leaf springs and disc springs. We also have a diverse client base. On an annual basis we take around 30,000 orders from nearly 1,000 different customers. For example, plants like power plants and steelworks use many kinds of springs a little at a time. Some of these require that production records be kept for decades. We made base-isolating springs for the Tokyo Sky Tree, a big project that's been in the news lately. --When did you start working with springs for the space industry? It started when they started using our disc springs for the engine propulsion regulator valves on the H-IIA/B Launch Vehicles' rocket engines. Later, AKARI, the Infrared Astronomy Satellite that was launched in 2006, was fitted with our nano leaf springs for pressure detection in a sensor. In addition, we are now developing springs that'll be used on rocket engines. In fact, I once got to see a rocket launch at Tanegashima. It made such a deep impression on me, and we went back to our lodgings and had a toast to celebrate the launch. I'm proud that our springs go into space. Some of our workers go home and say to their kids, "The springs daddy made fly into space!" --Space components have strict standards, don't they? Speaking from experience, having obtained certification for a number of standards, including ISO, the point is not simply just to get certified. We make products exactly according to the specs that customers request and deliver satisfactory products to them. We get the certifications so we can adapt to their requirements. As for space components standards, they're a way to hugely raise corporate value and are a barrier you have to clear to raise the level of your products. But you always have to think hard about why you're going to get certified for a standard, not just go for the certification itself. Meeting space component standards and having our springs used on JAXA's rockets and satellites is a major source of pride for us and customers see it as a big selling point. We think of it as proof of our high reliability, which says that we can do things correctly and precisely. --So you place a lot of importance on your employees' technical expertise and skills to achieve high quality and precision? We believe that "building springs means developing people." You can't make good springs just with machines. They come from highly skilled workers with good hands. That's why it is imperative for us to improve our employees' technical expertise and skills when it comes to making springs. We can make whatever sort of spring we want on the drawing board, but it takes teamwork between individuals to make truly great springs. You can't do it if you don't have the implicit knowledge drilled into your body, mind and skillset. We've always cultivated this sort of culture, or spirit. New employees undergo training for around three years. When they finish they can make springs, but that's not the end of the process. We categorize our workers into three levels. The toughest to reach is Level 3, with only one out of thirty people a year able to meet the requirements. If you reach Level 3, then your salary goes up and you get treated like an executive. You also receive permission to go into the Keishokan factory, a factory we built in 2009. We select our best engineers, our top-level workers, to give our Level 3 workers further instruction and pass on their techniques to them at the Keishokan factory. --That's a rare business model to have these days. A lot of companies try to compete with those in emerging countries by desperately trying to cut costs, but this is not a day and age when we can increase sales that way. Our company's idea is to live on products with added value, not cost-cutting. That's why we only make springs that are high quality and with high precision, no matter what our clients demand. Naturally we keep a constant stock of around 2,500 types of materials other than just standard spring steel, such as Inconel and die steel. These special steels are made-to-order, so it takes a few months to get them after you order. In some cases you wait a year. We've been using computers for the past 40 years to monitor the situation and order when necessary so that our stock doesn't run out. We have to have a lot of customers since we produce many products on a small scale, but it's pretty hard to find customers who only order small lots of special springs. With the growth of the internet we've publicized our engineering and knowhow and have been approached by many universities, laboratories and others. That's how we've been able to get 200 companies a year as new customers. In the future we're thinking of making English and Chinese versions of our website so we can get various complex orders from overseas.